My mother was an expert baker, the type who pulled out at least a half-dozen or so recipes at Christmastime to prepare for family and friends. She even had certain cookie cutters for certain varieties: her gingerbread bears, for example, or shortbread stars. I treasure the time I spent baking with her as a kid, when I was allowed to ice the candy cane cookies and sprinkle them with red sugar. You would think that at least a fraction of my mother’s baking skill might have transferred to the next generation, but you would be wrong. I would barely know how to recreate my mother’s pinwheel cookies (with two sheets of dough carefully rolled together), or her high degree of difficulty pizzelles. And as much as I love shortbread, I have already proven myself to be a shortbread dummkopf. Still, why should my kids miss out just because their mom isn’t exactly Betty Crocker? 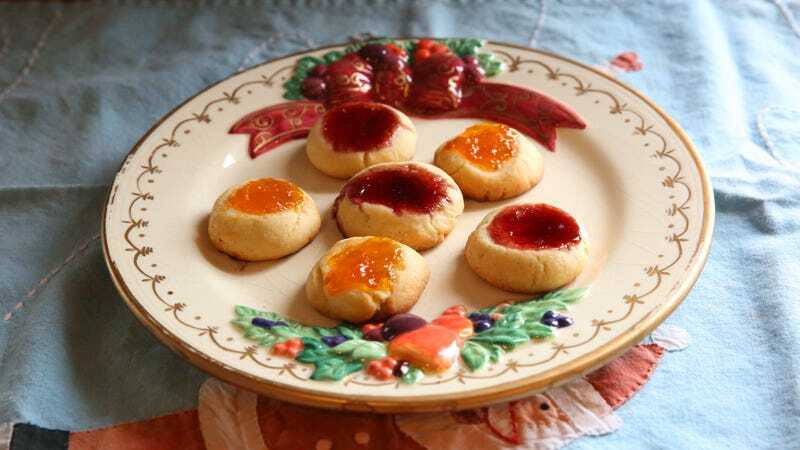 So when my kids became of baking age (around 4 or 5) I decided to pare down my Christmas cookie craziness into two varieties to leave on the plate for Santa: the classic peanut butter blossom for my daughter the chocoholic, and for my son, the jam fan, I went with thumbprint cookies. I found an Epicurious recipe that was enough like shortbread but a bit more forgiving (it added an egg), and I let each kid pick their favorite jam for the filling. The best part, of course, was the thumb part. When the kids were younger, they could not believe I was actually encouraging them to stick their fingers (well, their thumbs) into the dough. It was like a mini, temporary version of the handprints I got from their pre-school, except delicious. We still make these wonderful cookies, although lately, those thumbprints are a little larger (sob). But y’know, that just means more room for jam. I don’t have a stand mixer, so I admit that I start combining the dough by hand toward the end. I also don’t bother with the confectioners’ sugar, but some years I add lemon extract, or almond, or scrape in some vanilla bean seeds. We’ve used a variety of jams and preserves from raspberry to apricot to blueberry. This year, I learned that the “spreadable” part in fruit spread means that jam makes for a better filling option. Hope Santa still enjoys. Click here for Epicurious’ recipe.